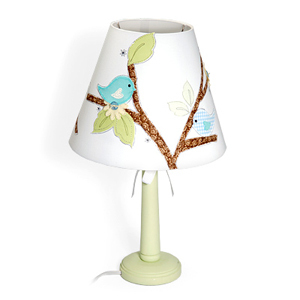 Decorate a plain lamp shade for a cute accent in the baby's room or at your own crafting table. The fabric pieces are easy to die-cut. Craft from Sizzix. Use fusible web to adhere two pieces of fabric together. Die-cut Bird from fabric. Finish edges with zig-zag stitch on sewing machine. Apply fusible web to various fabrics. Die-cut Leaves from fabric. Hand cut branches from fabrics. Stitch edges of branches if desired. Attach all die-cuts to lampshade using a warm, not hot, iron or use fabric glue. Embellish with pen and buttons.